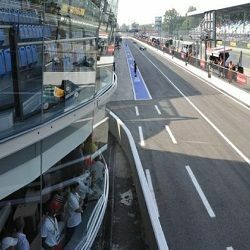 The Italian Grand Prix, hosted at Monza since the 1920’s, never fails to get your pulse racing. Join the famous tifosi fans, and enjoy watching the home team, Ferrari. Monza has one of the most challenging race tracks in the world, it features the highest straight-line speeds at around 350 kph and the highest percentage of the lap spent at full throttle. 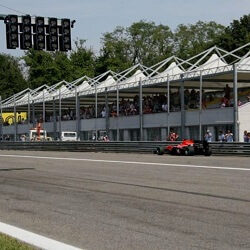 Italy Grand Prix hospitality reflects this excitement, blended with the passion and enthusiasm of the Italian fans. Be right there at the starting line in the Box Monza or the Fan Club restaurant; watch the cars screaming down the straight whilst you enjoy delectable hospitality. With a hostess to welcome you, a private stand and superlative service, this is Italian Formula 1 hospitality at its very best. Stay in one of the finest hotels in Milan: the Four Seasons and Park Hyatt hotels; dine in gorgeous restaurants and soak up the Italian night life. Among the historic structures of the circuit, there are the old team garages, no longer in use,…. The Fan Club Restaurant is located on the ground floor of the Hospitality Centre, directly oppo….